Ain Dubai ... work is in progress. Kanoo Energy, a member of top industrial projects supplier Kanoo Group, recently completed a subcontracting project for fall arrest systems on ‘Ain Dubai’, a project by Meraas which is set to be the world’s largest observation wheel. Located on Bluewaters Island off the Jumeirah Beach Residence coastline, Ain Dubai (previously ‘Dubai-I’) will offer 360-degree views of Dubai, with dimensions far exceeding any similar existing structure. The project’s main contractor is Hyundai Engineering & Construction. The assembled hub and spindle is approximately 40 m long and 20 m high and weighs 1,805 tonnes, equivalent to four A380 aircraft. The hub will later be connected to the rim through 192 spoke cables, with the structure then resembling a gigantic bicycle wheel. The scope of work included supply, installation and certification of vertical lifeline system (Lad-Saf Systems) inside the legs. The hub of Ain Dubai consists of four cylindrical legs of 120 m height, 17 vertical ladders measuring a total of 30 ft inside each leg, and 14 ladders inside the spindle which is 150 m above the ground level. Kanoo Energy – PIP Division, having the only fall protection team in the region certified to install such systems and trained to work at such heights, successfully completed the installation and certification of all the ladders inside the legs and the spindle. The team will also recertify the system annually. 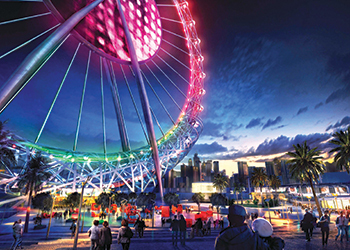 Once completed, Ain Dubai will feature 48 capsules and a holding capacity of up to 1,400 visitors at any given time – with a full rotation of the ferris wheel taking 48 minutes. 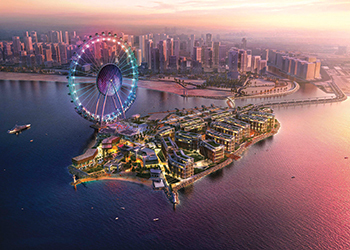 Ain Dubai will be the centrepiece of Bluewaters Island, which will feature retail, residential, entertainment and hospitality offerings.